The Boulder Creek Festival takes place in Boulder Colorado in May. 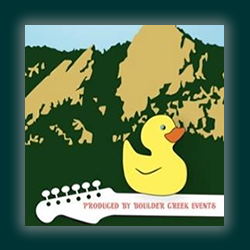 This huge festival in Downtown Boulder Colorado features the ever popular Duck Race, special events and childrens activities, many vendors booths and shopping opportunities, great food and beverages, live entertainment, and so much more! This is a free event in Boulder and a great way to kick off your summer fun with this lively celebration – don’t miss the Boulder Creek Festival this year! Discover more of Boulder Colorado at the Boulder Guide. 80302, Boulder Celebrations, Boulder Colorado Events, Boulder Colorado Fun, Boulder County Colorado Events, Boulder Creek Event Productions, Boulder Creek Events, Boulder Events, Boulder Festival, Boulder Festivals, downtown Boulder, Downtown Boulder Colorado, Downtown Boulder Events, Duck Competition in Boulder, Duck Race Boulder, Ducks Boulder Colorado, Events 80302, Events Calendar Boulder, Family Fun Boulder, Fun Events Boulder, Fun in Boulder, Things to do in Boulder, Things to do in Boulder Colorado, What to do in Boulder?, Where to go in Boulder?